Mom’s who do their best to make it through another day. Harry and David’s chocolate covered strawberries!!! That you should eat alone. While hiding in the closet. Here is a great example and first entry!!! This entry was posted in Uncategorized and tagged average, chocolate covered strawberries, contests, moms. Bookmark the permalink. I love it. 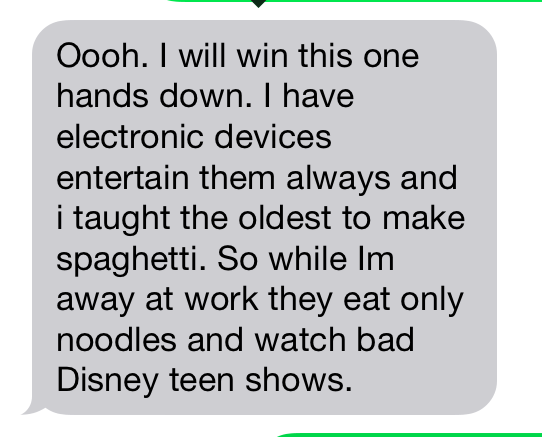 Teaching your daughter to make Cup o noodles is teaching independence and life skills, so rock on, fellow average mom. I may not win because I’m an overly competative single mom. We have activities every night except Thursday. We play most of the day Saturday. I don’t want anyone to think I’m not doing enough. I don’t make lunch. The kids eat school lunch. After watching the play ground, the lunch lady sends home random left overs that we eat through the week because I’m too busy skating. I do make a big Sunday dinner so there are enough left overs for a couple days. I throw a party every month so I’ll clean the house. Other than that . . . I’m at the gym, skating or chauffeuring. I taught my son laundry at age 7 so I didn’t have to do his. He can only do afterschool activities within walking distance because I don’t want to take him. I refuse to sit and watch his karate practice or swim lessons (but I will go to his plays). I only keep artwork if it is substantial (no little scribbly drawings). I stopped allowing toys in the living room when he was 5 so I didn’t have to pick them up (or step on them). I need a more centrally located house so I don’t have to drive my kids to swim! I don’t have kids, and I wouldn’t be nearly as much fun if I did, but I love chocolate-covered strawberries. Let’s see. Where do I begin. I married a man who is amazing. I am lucky. He wakes up and makes three different breakfasts and then lunch for the three of us. He then takes our daughter to school and I take the little one to daycare across the street (yes, sometimes we drive). Then I hired a gal from school to pick up my daughter and my husband takes her to practice. At night, my husband gets the little one ready for bed. I can’t brush his teeth because I can’t handle to look in his mouth with all the metal. I try everyday. I lose my patience everyday. But I love my children and make sure they are happy. So, the house may not get cleaned, the clothes may not get folded for a couple of days and the dishes are piled high, but we have fun and they know how much they are loved. One of my middle babies (ok, she’s five) had the stinkiest feet in all the land last night…like beyond gross, smell filling up the whole room…and I realized she hadn’t been bathed in at least 5 days. I plunked her in the bath and taught her to wash herself so I didn’t have to touch her filth. Definitely average mom stuff. That’s classic. I had my kids showering by themselves for weeks before I realized my youngest wasn’t using any soap. Luke, 13, was telling me about this kid at school that he just can’t understand. “His mom makes him a home lunch everyday with really good sandwiches, you know with meat and cheese, and chips and rice crispies. And it makes me so mad because he trades it for a school lunch. I mean his mom makes that for him with love every morning and he just trades it away for crap school lunch.” When I asked if he would trade his school lunch for it he said he wouldn’t disrespect that kid’s mom by doing something like that, I mean she put all that work into it. Doesn’t he love his mom? So feel proud about those lunchables and fruit. Also if I was a stronger person I would cancel netflix for the summer…..and I don’t care about what their clothes look like in the drawer. I just give them a laundry basket with the clothes and say the drawer needs to close all the way after they are put away. I also think that if my kids were quiet and not directly in my space at night they would be able to stay up until midnight :). Please still respect me after you read this. I routinely forget to pick up my children and have been known to leave them over night at birthday parties that were not sleepovers. I play Disney Frozen on my phone while the kids are doing their chores. I switch to my budgeting app whenever they get close so they don’t know I’m not actually working. That’s right ladies, mother-of-the-year I am not. But I love those little monsters like they are my own kids! And that’s what’s really important!!! “Average moms” raise kids who can look after themselves! Long live average. I’ve taught my kids how to pick the least stinky clothes out of the hamper when we haven’t had time to do laundry. There really is an art to picking out something that’s wearable without being too stinky and wrinkled. hahahaha! I know the contest is over, but just had to put in my claim to c+ motherhood. my boys did not smell any better after taking a shower- for at least a week. when I finally asked if they were washing their hair they told me there was no shampoo in their bathroom… and no soap… and no toothpaste… and no toothbrushes. for how long? I don’t know. I just know that I did not like being near my boys until we got this all figured out. then it happened again. why won’t my kids tell me they need more soap? or toothpaste? why don’t I seek answers sooner?